Note: This article includes spoilers for The Nun insofar as anything so predictable could be considered a spoiler. Some plot points revolve around suicide and abuse. Every so often a movie comes along that is simultaneously so bad and so poorly timed that even a jaded non-believer like me can’t help but attribute the whole mess to some form of providence. This month, I submit to you: The Nun, the latest spin-off in the growing constellation of The Conjuring movies. If you’re reading this to decide whether or not you want to see The Nun, don’t bother. Roger Ebert coined the term “idiot plot” to describe a plot which works only if we take it for granted that every character is a complete idiot. The Nun tempts me to coin the term “too dumb to grasp object permanency plot.” It made plenty of money, and I’m sure there are two or three dozen other minor ghouls in the Conjuring universe, though, so expect a sequel by this time next year. Another entry in the recent horror renaissance this is not. I’m not here just to give a big fat thumbs down to a film that clearly hopes you won’t give it a nanosecond of thought after you leave the theater. I’m here to question whether it’s a good idea to be approaching anything having to do with nuns or churches with such thoughtlessness in light of the revelations facing the folks whose faith is being bandied about as a lurid bit of set furniture. I grew up in the Chicago area, one of the most Catholic parts of the country. My preschool was Catholic. If you live in South America for any length of time as I briefly did, the Catholic church is basically the only game in town whether you go or not. It is the second largest single religious denomination in North America. It informs the world views and moralities of more of your fellow taxpayers and voters and citizens than any other single faith. And there is a serious disconnect between what church doctrine says and what your Catholic friends and neighbors are most likely to believe, based on every credible study. Despite the official church lines on birth control, abortion and LGBT rights, most Catholic laypeople in the United States hold views and keep practices much more in line with those of their non-Catholic friends and neighbors. That’s a huge, complicated picture of a diverse group of people before we get to any mention of the scandals and allegations rocking the church now (and we will get to them). There are lots of nuanced cinematic takes that represent a profound shift in the faith’s portrayal in film since about the 1960s. Yet, I would argue that apart from Hollywood’s ironclad, unshakeable, congenital Orientalism (which can misrepresent several major world faiths at once if it tries hard), there’s no other faith that gets portrayed as callously in exploitation films as Catholicism. One deacon writing about his faith in film seriously asks whether any non-horror film lately features a Catholic character in a remotely positive light. He points out that movies like Constantine or Hellboy are quick to arm their heroes with Catholic sacraments like holy water or crucifixes, but these are just trappings. Holy water is a Get Out Of Hell Free card—I think it’s in Leviticus somewhere? Meanwhile, as he points out, men of the cloth in movies are often villains and psychos. It is sadly not difficult to see why in light of the molestation scandals uncovered by the Boston Globe in 2002, or the more than 1,000 parishioners that are alleged to have been abused by priests in a recent report in Pennsylvania, or the allegations of decades of abuse and murder of orphans by nuns in Vermont. I don’t know the suffering of the victims, and I can’t know the pain and unease laypeople feel over these repeated, gruesome revelations because I haven’t lived it, but because I’m a human being who has been paying any sort of attention I’m aware of it and I hope I’m sensitive to it even as I write this. The Nun is not sensitive to it, not interested in it, and couldn’t begin to approach the matter if it was. Framed within the universe of The Conjuring, the story is set in a post-war secluded convent in the Romanian hinterlands. The mysterious deaths of nuns there prompt the Catholic Church to send one of their exorcist/inquisitor/holy hitmen, Father Burke (Demián Bichir), to investigate the matter, despite the fact it’s also established that the place has basically been cut off from all contact since forever. For reasons not at all sufficiently explained, he is ordered to bring along Sister Irene (Taissa Farmiga), a novitiate who has not yet taken her holy vows and who seems to have some connection to the evil spirit at work (or not … they really don’t bother to take time to explain this). They arrive in Romania to speak with “Frenchie” (Jonas Bloquet), the horny guy who discovered the body of one of the dead nuns. His horniness has no bearing on his discovery of the nun’s body, it’s just his only character trait. In the first reel we learn that the townsfolk believe the place to be haunted and have shunned it since time out of mind. And by “time out of mind” I mean literally hundreds of years, since the time of knights. There is Earth’s-core-deep subtext ready to be mined here about the utter disconnect many contemporary Catholics feel between themselves and the clergy, the higher echelons of which struggle to respond to clear calls for progress. The Conjuring steams right on by that gold mine without looking back, as our silly protagonists enter the clearly cursed and haunted convent. The only way the nuns have survived up here, utterly cut off from all human contact, is that Frenchie comes by with a single cartload of groceries for them, depositing them in an outbuilding and never once speaking to anyone. Once there, Father Burke and Sister Irene are greeted by a shrouded Mother Superior who is clearly a malevolent spirit, and they do not run immediately. It is never clear how many nuns are actually alive in the place or are apparitions. The few who are alive gradually reveal to Sister Irene (amidst many very conventional freak-outs that cut away from the characters in a way that makes you think they’re dead and then, nope, they’re fine) that the monastery is meant to seal off some gateway to actual hell, and a demon creature who is attempting to break free into the world but as yet can only do it through possession and suggestion. I want to back up for a minute: This is a religious order which is in a sealed off, isolated conclave, which is trying to contain some horrible bestial influence by praying constantly to drown it out, and the sisters are being stalked by somebody who dresses like them. There is a nary a wink nor a nudge to be found anywhere here, no telling moment that indicates the filmmakers are operating any deeper than surface level. “Nuns sure are creepy” is all The Nun is saying, while we are, within the past few weeks, hearing both about the terrible allegations coming out of Vermont and that nuns have infiltrated Smith & Wesson to make them issue safety reports because that is the length some of them will go to in order to hold gun-makers accountable to human decency. 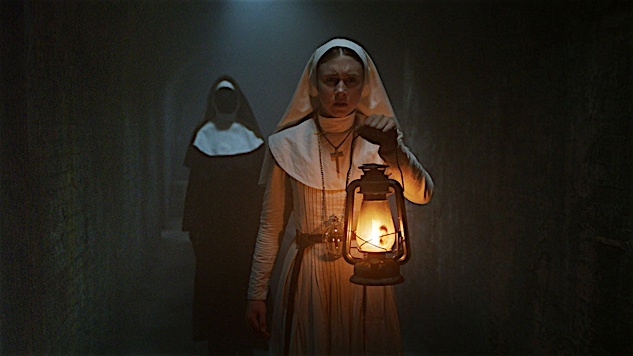 It’s not fair to expect every movie to roll up its sleeves and tackle this kind of subtext like it’s going to become the definitive statement on it, but The Nun works so hard to ignore what’s going on below the surface here that I couldn’t decide whether to be amused or frustrated while I was watching it. They could not have known, as they were filming this movie that begins with a young nun committing suicide because she’s being hunted by a bigger, creepier, demon nun, that reports would come out alleging that real-life nuns dangled orphans out of buildings, dropped them to their deaths, or forced them to eat their own vomit. Providence or not, there’s a message being sent here. Maybe we should all pray it’s getting through to the leadership of the Catholic church. Kenneth Lowe also writes at his blog.